When moving long distance, it’s important to choose a mover you can depend on. Dwight S. chose Herlihy Mayflower for his move from Westerville, Ohio to Sarasota, Florida. Our Columbus office packed and loaded Dwight’s furniture and other belongings in Westerville and drove them more than 1,000 miles to Sarasota. 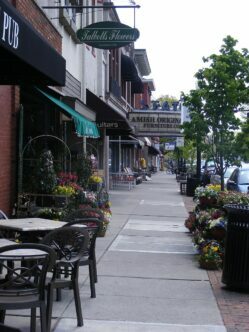 Westerville is a city of more than 36,000 residents located just northeast of Columbus in Franklin and Delaware Counties. The area surrounding Westerville first saw European settlers around 1810. The City of Westerville was platted in 1856. It contains several homes on the National Register of Historic Places, including buildings that were stations on the Underground Railroad. Today, Westerville is home to Otterbein University, a private four-year liberal arts college. Large employers with offices in the Westerville area include J.P. Morgan Chase, DHL Supply Chain, Progressive Medical, Alliance Data and other companies. After Dwight’s furniture and other belongings were unloaded at his new home in Sarasota, he wrote to tell us how pleased he was with the moving process. We appreciate your kind words, Dwight, and wish you all the best in your new home in Florida. Looking for a professional, reliable Columbus, Ohio moving company serving Westerville, Ohio? Contact us today to experience the Herlihy Moving & Storage difference. As one of Ohio’s oldest moving companies, we have moved thousands of families and businesses within Ohio, across the United States, and around the world. We’re BBB accredited and Angie’s List approved. And, as a locally owned and top-rated agent of Mayflower Moving serving Chillicothe, Athens, and Columbus, Ohio, we have the resources to move you, no matter where you need to go.